So, you’ve determined that inbound marketing is for you, and that it’s an investment that can help you attract new customers and grow your business. Now we move from the “why” to the “how” to learn that it’s the tools of inbound marketing that are practical in reaching those new customers. For those of you who offer breakfast as part of your services, consider this scenario: You get up early. You preheat the oven. You get the pans out. The kitchen counter is lined with food to be cooked, ingredients to be fashioned into something good. All of this is meant to become a beautiful, delectable breakfast for your guests. You leave the kitchen in the hopes that all of those things will work together to become that breakfast. But when you return, you find them all precisely where you left them. There is no piping hot bacon or sausage, no golden pancakes, no buttery biscuits, no fluffy omelets. Everything is where you left it. The food and ingredients cannot make themselves. The same is true for inbound marketing: it is not practical or proven until its tools are engaged and applied on a regular basis. Truth be told, you want your site visitors and prospective customers to have a satisfying experience. They’re more likely to return and visit your site longer if they like the content or find it useful. Understanding who you want to visit your site and who you want to target as prospective customers is important to figuring out which tools you pull out of the toolbox. Some might be more helpful than others. 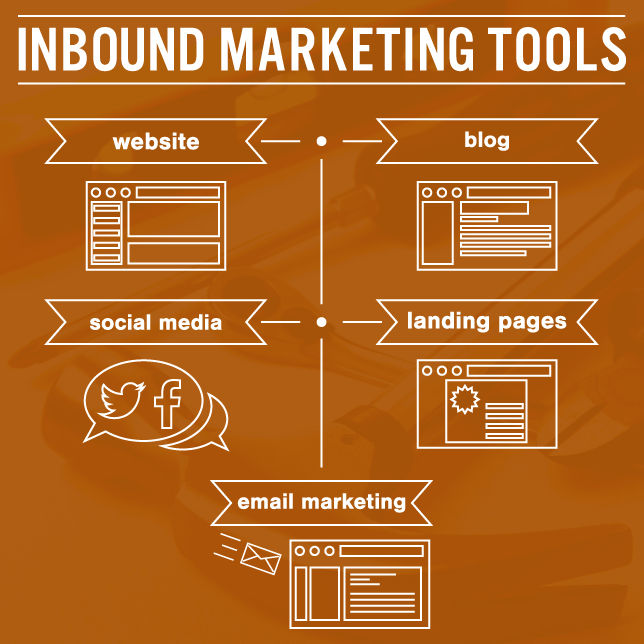 Whatever tools for inbound marketing you decide are best, you must give them time and attention. If InsideOut Solutions designed your website, you’re already doing well in this area. Whether to have a website these days is no longer even a point of discussion since the world is doing a large portion of its business on the web. Since customers are searching for what they want, it is essential to have a website that shows what you offer. Also, a good website that invites attention is part of what your inbound marketing strategy should include. Remember that you don’t need to go door-to-door or buy expensive time to interrupt people in their car or on their couch. Those same people are using the internet to find what they want on their terms and in their own time. A beautiful, clear, and functional website is a key way to lead them down the path to you. Indexed posts: The more you have, the better opportunity you have to get found online. Properly optimized blogs have a tendency to increase your rankings in search engines and, importantly, also widens your visibility in search for keywords. More leads: Draw prospective customers to your site with relevant, smart blog articles and invite them to return by consistently publishing quality information. HubSpot reports that 43% of companies have acquired a customer through a blog. 43% isn’t a number to sneeze at. Increased trust: Once you have valuable content that site visitors want, they’ll come back to you for more. This increases the chances that you’ll turn those visitors into customers, and that you’ll gain advocates for your business. Remember that just because a visitor doesn’t become a customer doesn’t mean they won’t become an advocate. How to approach this inbound marketing tool is a struggle for some individuals. They might blog a lot, for instance, but fail to ever really distribute the content they create. Blogging is not an if-you-build-it-they-will-come tool. You can write the most prolific blog articles ever, but if you fail to distribute them to an interested audience, they’ll collect internet dust for years. Social Media Marketing is basically using the existing tool of social networking. All the major social media brands (Facebook, Twitter, Google+, etc.) are built on networks of people. Call them friends, followers, circles, or whatever you like. But people talk and share and think together on the internet. Smart inbound marketing uses this interconnectedness to achieve a new kind of word-of-mouth marketing. While we won’t explore in depth the advantages of each social media channel in this post, it’s important to note that without proper and timely use of social media marketing, you’ll end up adrift in a vast sea of nameless websites. And your users would likely have better luck finding the proverbial needle in the haystack. Landing pages are self-defining in name and function. Are you wanting to promote something on your website, but not necessarily have the visitor see your main page yet? A landing page is a strong method to accomplish this. Typically, this page is designed to get information from the visitor (usually name, contact info, etc.) and for you to provide something in return (additional information, content, contact, etc.). The goal should always be, with any content, to establish trust and a bridge of communication. Invite the visitor to learn as much as he/she wishes, and use solid, valid content like landing pages to give them something in return so that they trust you and want to return for more. Some may think that email marketing is just another word for spamming. On the contrary, it’s a strategic method of reaching out to and keeping track of individuals who have provided email addresses (at the landing pages, for instance). As with all the other tools, email marketing is all about timing. Coordinated with landing pages, email marketing seeks to provide prospective customers information that they’re seeking. Send emails to them with content that builds trust, meets their needs, and speaks to their pain points. For instance, if you know a lead is constantly reviewing vintage wine selections and you’re sending them craft beer newsletters, you’re not going to invite further interest and your off-topic emails are likely to send them off to a competitor. All of these inbound marketing tools are meant to be tailored, handled appropriately and with consideration of your prospects. If you’re only preaching about what you’re selling, you’re not going to build much of a following. Buyers want engagement, learning, trust, and relationships. This is true across all industries. Understand that no one comes out of the gate as an expert with inbound marketing tools. But investing your time in learning about them and using them increases your chances of generating more leads and eventually customers. Join us for the next post in this series, “Attract with Inbound Marketing,” to find out what flower blooms, curb appeal, and fast food logos have in common. Currently, of the inbound marketing tools, we offer blogging and email marketing services. Click below to contact us and find out more about these services.